Whether you are upgrading to gain the benefits of a more efficient heating and cooling system at your present address or building a new home, Trane’s line of leading comfort equipment has a capacity, efficiency and price that will suit your needs. Count on the C & H installation team to make sure you enjoy maximum performance right from the start. Systems include cooling, heating, air cleaners, thermostats and accessories. When you need service on your home comfort system, our technicians can quickly and effectively diagnose, adjust or repair it to restore peak performance and efficiency. From air conditioners to furnaces and boilers, we handle all makes and models and, in most cases, fix your issue on the first visit so you can get on with your day. Maintenance is essential to having your equipment perform at peak efficiency and achieve full life-cycle durability. 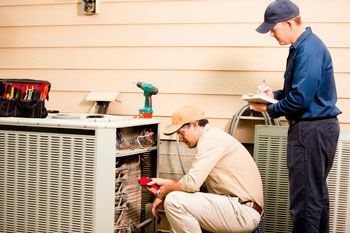 Before the cooling or heating seasons, consider having your system checked out by one of our maintenance experts. When you let things go, small problems have a way of getting much bigger and lack of regular maintenance can cost you comfort and reliability. Get a C & H Heating & Air Conditioning maintenance agreement and find out all the ways it pays to maintain! Indoor air pollution can actually be worse for you than outdoor pollution. If you want cleaner, healthier indoor air, we can supply and install the latest in air filtration, air decontamination, dehumidifiers and humidifiers. Leaky and undersized ducts can significantly increase air conditioning and heating bills, downgrade equipment capacity and performance, and result in adverse indoor air quality conditions. 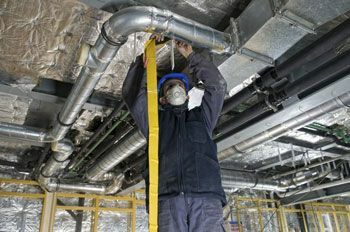 We can seal, design or redesign your duct work to keep the good air flowing efficiently. Our sheet metal experience enables us to quickly and accurately custom fabricate duct systems for homes, businesses and warehouses. We have specialized expertise in steel, galvanized steel, copper, stainless steel, and many other metals. We provide complete plumbing services – from everyday faucet and toilet repairs and replacement to installation of water heaters and other major components. Our team is knowledgeable on products old and new, and we offer the proven quality of top brands to ensure you get the most performance, value and peace of mind. For timely, superior service on your cooling and heating system, or a comprehensive energy-saving equipment replacement, C & H Heating & Air Conditioning has your office or industrial building covered. Our commercial crew delivers fast service and reliable solutions at prices that make sense. Have a question or need service? Call us anytime at (417) 627-9894.